The Boxwood Globe topiary is one of the most elegant and intriguing topiary plants on the market, and is accordingly able to brighten, enhance, and complement the atmosphere of most any room or area. The plant itself is a carefully trimmed, moon and sphere-shaped topiary that successfully tows the delicate balance between traditional styles and textures and modern plant compositions. This outstanding plant is firmly established in a durable and good-looking footed resin planter, which like the greenery which it contains, does well to encompass the best of tradition and innovation. Additionally, the globe and the planter will be carefully packaged by our team to assure a safe arrival to your residence. The Boxwood Globe is preserved in a simple yet safe and effective manner. Inside our state-of-the-art preservation rooms, the plant is exposed to a sizable amount of heat in a relatively low-humidity area. Then, as the plant becomes dehydrated and in-need of additional liquid, an all-natural, kosher glycerin solution is introduced and absorbed by these thirsty plants. This solution, in turn, preserves the plant for many years to come. 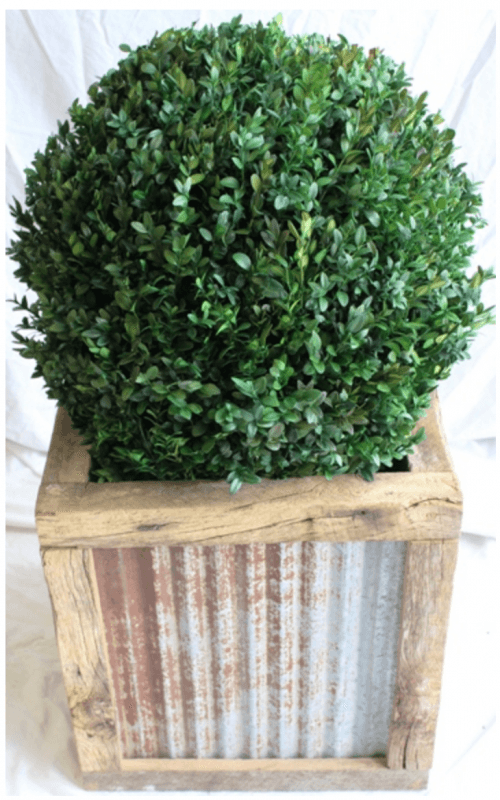 We also utilize FDA-approved food dyes in our plants, including the Boxwood Globe, to preserve their color, tint, hue, and even allow for a more sophisticated and custom look to be achieved. All of our solutions and dyes are completely safe for you and your family to be around. The Boxwood Globe, in addition to looking excellent and being treated with the highest-quality chemicals and procedures, will last for an impressive amount of time, with proper care and maintenance (these procedures will be discussed below). Boxwood Globe plants are guaranteed to live for seven years, and often times, will surpass this lifespan without faltering whatsoever. As was said, assuring that the Boxwood Globe reaches and/or surpasses its life expectancy is important, and can be completed in the form of proper care and maintenance. Many customers are certainly worried about this point right about now, but there is no need to worry; most of this “care and maintenance” relates directly to what SHOULD NOT be done. There is no reason to expose the Boxwood Globe Topiary to direct sunlight and/or water it; doing either of these things, although they seem like a good idea, will negatively impact and shorten the plant’s life span. Similarly, it’s not a good idea to leave the Boxwood Globe outdoors, where it can be targeted by insects and animals, as well as jealous neighbors (in our experience, the latter of these threats is the most common. Consider purchasing an extra couple plants for your neighbors!). Moreover, sunlight and the elements may also be a problem for topiaries which are placed outside. The only maintenance that the Boxwood Globe can benefit from, besides avoiding the above steps, involves simple and easy dustings, using either a feather duster or a can of air (hold the can at least two inches away from the plant, and brush gently with the feather duster). There are a million reasons to enjoy a Boxwood Globe, from the value and the integrity of appearance to the long life expectancy and convenience which it boasts. Don’t delay—purchase a Boxwood Globe today so that you’re one step closer to the perfect atmosphere tomorrow!